The Uinta River is one of many rivers & streams in the Uinta Mountains that provides excellent fishing for native Cutthroat Trout as well as other species of trout, such as Rainbow Trout, wild Brook Trout & Brown Trout and Mountain Whitefish. 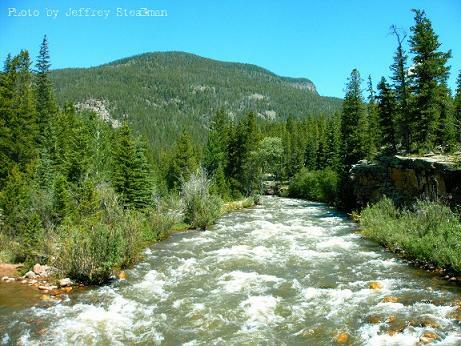 The Uinta River is one of Utah's beautiful rivers that flow down from the Uinta Mountain range. It is located on the South slope of the Uintas, north of Roosevelt in Northeastern Utah, in Uinta Canyon. Since it is not located close to any large urban areas, this river provides lots of solitude	from the usual crowds that can form on other more popular waters such as the Green or Provo Rivers. Flyfishing using dry flies can be exciting for vividly colored wild brook trout and yellowstone strain cutthroats. These are not your pale bear lake cutts, these are fiery yellow and red, beautiful fish! The Uinta River is located in the Uinta Basin in Northeastern Utah.